Schedule Performance Index (SPI) and Cost Performance Index (CPI) allow you to evaluate the performance of a project. They demonstrate the schedule and cost efficiency of a project. Basically Schedule Performance Index (SPI) can be calculated by dividing the Earned value (EV) by the Planned value (PV). And the Cost Performance Index (CPI) can be calculated by dividing the Earned value (EV) by the Actual Cost (AC). These calculations show how efficiently you are proceeding compared to the planned project work schedule and budget. In this article we will review both concepts with the help of mathematical examples. Schedule Performance Index is a measurement of your efficiency depending to the planned work schedule. The ratio of earned value to planned value gives the Schedule Performance Index (SPI) . It provides information about the schedule efficiency of the project. The SPI can be calculated by dividing Earned Value (EV) by Planned Value (PV) as shown below. The formula gives 3 results regarding to the schedule performance of a project. • SPI >1 : We are ahead of schedule and we completed more than we planned. • SPI <1 : We are behind schedule. We completed less than we planned. • SPI =1 : We are on schedule. Work is completed as per the planned. Note that while calculating the SPI of the overall work schedule, be sure that you take for all the activities. Considering only the critical path activities can not give accurate results. Therefore you must take all the activities. Now we will calculate the Schedule Performance Index (SPI) and Schedule Variance (SV) based on the information. SPI < 1 ; The result is less than one . So that we are behind the schedule. The Cost Performance Index (CPI) is a measurement of your efficiency depending to the Earned Value (EV) and Actual Costs (AC). It is the ratio of Earned value (EV) to Actual Costs (AC). It provides information about the cost efficiency of the project. The Cost Performance Index(CPI) calculates the value of the work completed compared to the actual cost spent. Simply we can say that The Cost Performance Index(CPI) calculates how much we are earning for each dollar spent on the project. The formula gives 3 results regarding to the cost performance of a project. • CPI >1 : We are under budget. We are spending less than we earn. • CPI <1 : We are over budget. We are spending more than we earn. • CPI =1 : We are on budget. We are proceeding as per the planned. If we proceed with this ratio we will complete the project on time. CPI < 1 ; We are over budget. This means that we are earning 0.55 USD for every 1 USD spent. A high or low value of SPI or Cost Performance Index (CPI) shows that your estimates are not compatible with the targets of your project. You must revise your assumptions and take corrective actions if needed. Both Cost Performance Index (CPI) and SPI gives 3 results regarding to the performance of the project. If Cost Performance Index (CPI) or SPI is equal to one, this means that the project is proceeding as per the planned. Both Cost Performance Index (CPI) and Schedule Performance Index (SPI) need Earned Value (EV) to make calculation. Both Cost Performance Index (CPI) and Schedule Performance Index (SPI) measurements depend on the project’s past performance and they can be used to estimate the future performance. Cost Performance Index (CPI) and Schedule Performance Index (SPI) measurements improve decision making among the project team. 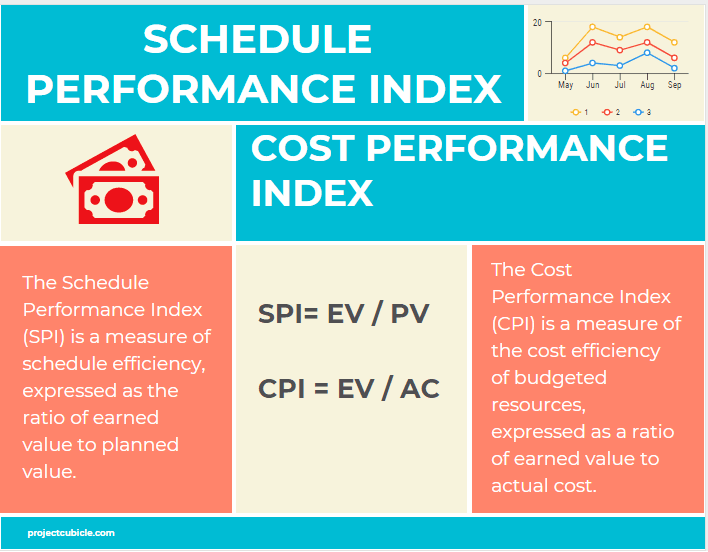 The Schedule Performance Index (SPI), Cost Performance Index (CPI), Schedule Variance (SV) and Cost Variance (CV) are performance indicators used in the Earned Value Managment. By the help of these tools it is easy to understand health or sickness of our projects . Project size, duration and other properties do not make any difference in the calculation of these indexes. Project teams must be aware of their project’s current performance to make realistic forecasts for the future performance. These metrics provide valuable information that helps to complete a project within budget and approved schedule. Earned value (EV) measurements use indicators to analyze a project’s past performance and estimate it’s future performance. In this article we review both Schedule Performance Index (SPI) and Cost Performance Index (CPI) concepts. If you are preparing to take the PMP or CAPM Certification Exam, you must know their key aspects and importance for project management.